Have you ever asked God that question? When G0d gives you an assignment – a task to do, something you need to say, somewhere you are supposed to go – but you have no idea how it’s going to happen? I’ve been there. In fact, I’m there pretty regularly. And I find myself asking God this question – how am I going to do this? What has he already given me? Good question. This starts me into a process of reviewing the gifts and skills which God has grown within me. These are the things God wants me to use to complete my new assignment. I will also review what God has been teaching me lately – he has a purpose for opening my eyes to a new truth. He wants me to use this new knowledge and awareness in order to complete the task he has given me. Do you know what I discover when I review what God has already given me? I find that God has been preparing me for the things he wants me to do and say and the places he wants me to go. 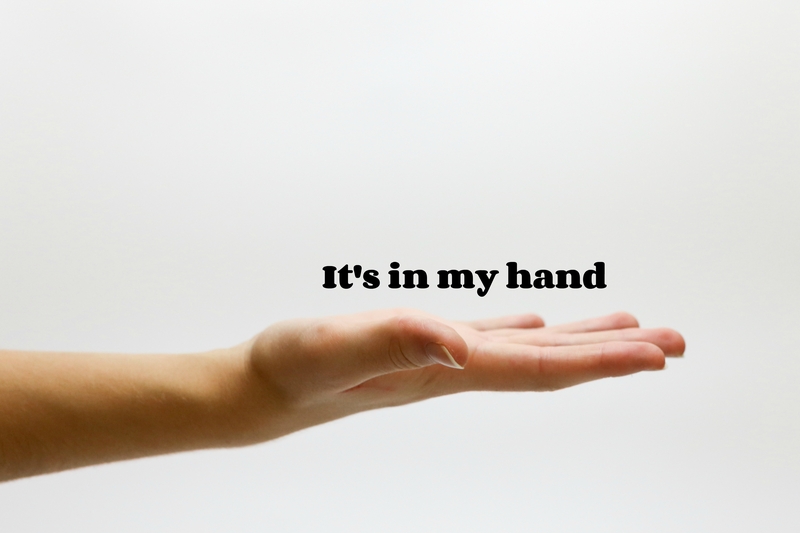 It’s all in my hand. Sometimes we don’t feel that we have the right skills or experience or knowledge to do what God is asking us to do. That’s how Moses felt when God told him to go back to Egypt to free his people. What if they don’t believe? What if they don’t listen? 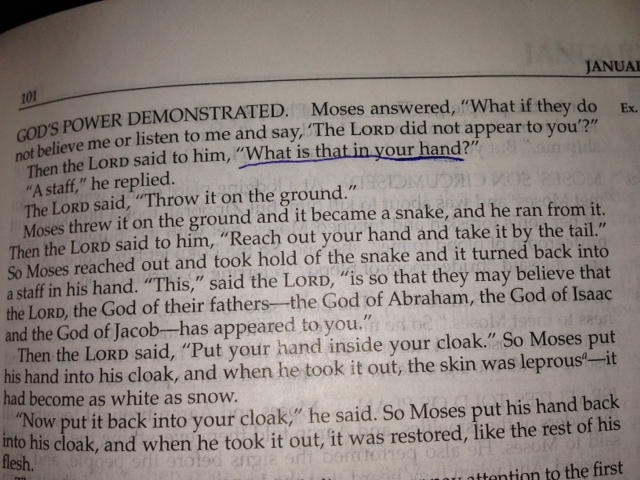 And then God asked Moses to look at what he already had in his hand and use that to do what God was asking him to do. So – let’s look at what we already have – what God has already given us – and figure out how to use it to serve him. Do we have a car? Do we have a house with some chairs in it? Do we have a couple of hours we could turn off the TV and computer and serve him? Let’s not focus on what we can’t do – let’s just figure out what we can do. What do we already have in our hands? Dear Father, we thank you for how you have so richly blessed us. Please open our eyes and hearts to how we can use what you’ve already given to us in order to fulfill your purpose for us here on earth. In the redeeming name of Jesus we pray, Amen.